(L to R): Front: Jeff Leiden, MD, PhD, Vertex Pharmaceuticals; Betsy Nabel, MD, BWH president; Carol Greider, PhD, John Hopkins University. Middle: Barbara Bierer, MD,BWH senior vice president, Research; Joseph Loscalzo, MD, PhD, past-director, Brigham Research Institute, chairman of BWH Department of Medicine; Jacqueline Slavik, PhD, executive director, Brigham Research Institute; Susan Lindquist, PhD, Massachusetts Institute of Technology; Christine Seidman, MD, director, Brigham Research Institute. Back: Terry McGuire, MBA, Polaris; Richard S. Blumberg, MD, co-director, Brigham Research Institute; Michael Rosenblatt, MD, Merck; Paul Anderson, MD, PhD, associate division chief of BWH Division of Rheumatology, Immunology and Allergy; Geoff Smith, JD, Mount Sinai Hospital. On May 12, the first BWH Scientific Advisory Board convened to provide strategic counsel and vision to further enhance research at BWH. 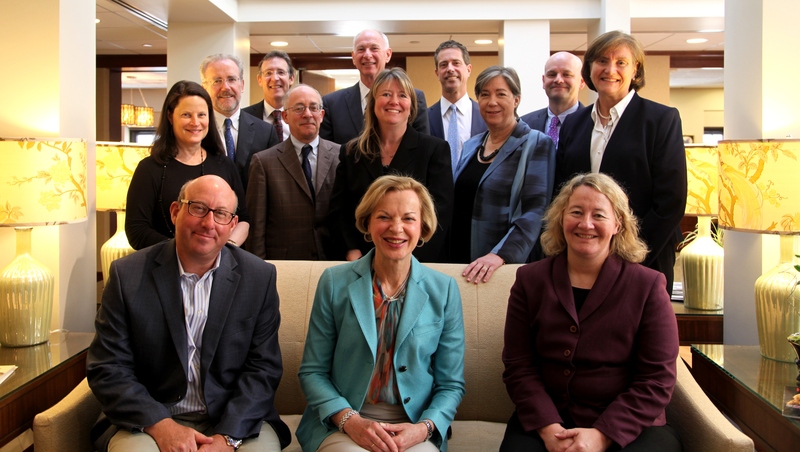 Leaders from academia and the biotechnology industry joined BWH President Betsy Nabel, hospital leaders and Brigham Research Institute leadership at this introductory meeting. Discussion topics included supporting training of the next generation of physician-scientists and scientists; building strong relationships with pharmaceutical, venture and philanthropic communities; creating more of an entrepreneurial culture; and identifying scientific domains that capitalize on BWH’s strengths.